God bless America for its very efficient USPS (United States Postal Service). Every time I go out on a trip that takes longer than a week, I always request online to put my mail on hold, to be delivered only at a date I specify. And sure enough, a bundle of it, strapped by a rubber band, was wedged tightly into my apartment's mailbox when I opened it today. Why put a mail on hold? For security reasons. A mailbox that's overflowing with mail is usually a red flag for thieves. New York, even with its high rise apartments, have thieves just like there are rats in its subways. Besides putting the mail on hold, I also use this gadget that, at a designated time, turns on and off a lamp in my living room. It's as if to say "I'm home". This kind of in-house security system has been working well for me so far. Let there be light/Let there be no light. . . I went through my mail, an assortment of letters, bills, magazine subscriptions, special offers, catalogs, and brochures. 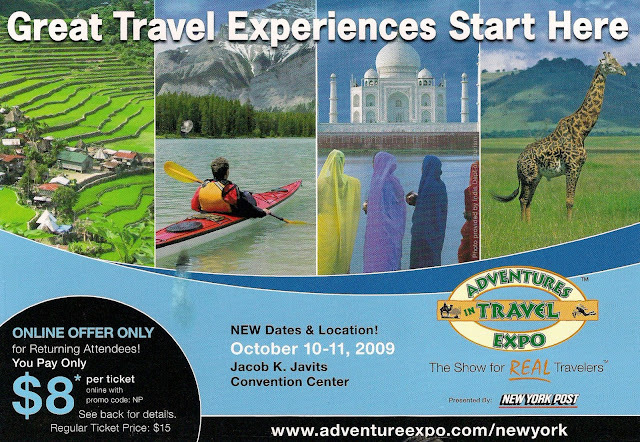 What really caught my eye was this postcard-size mail from Adventures In Travel Expo announcing next week's exhibit in New York. The photo below - that of the rice terraces in Batad (left) - struck me, having just arrived from typhoon-ravaged Manila. The good news is, the Philippines is joining this important travel show once again. Oh well, I miss the Philippines already! When can I see you again Pilipinas? "A mailbox that's overflowing with mail is usually a red flag for thieves." ...absolutely right! wise move on keeping your mails on hold. i'm just clueless : how much is that security gadget? is it battery operated or does it requires to be plug in? i'm only familiar with the alarm system; this one is cool. I bought my Intermatic lamp & appliance timer several years ago for about $8.00 from a local hardware store. You only need to plug it in after determining the time you want a lamp to be turned on/off. That is smart... seems you had a lot of post when you came back ! Glad to see you're back safe and that judging by the Phil posts you've had a grand time back in the hometown. Might I ask where's next? Oh, I didn't realize you were in Manila when the typhoon passed by. I can only imagine being there. And yes, you're right. The full mailbox is a thief enabler. And yes, USPS is great with this system, isn't it? I don't think the Philippine postal system even has this service. UGH the nomadic Pinoy's BACK IN THE STATES? !..I'm sure and i can feel na bitin ang byahe mo..but u seemed to enjoy, san the storms. I just thought it wil be a long holiday for you and more photoshooting way back. guess lots of work's waiting for u outhere as per those posted mail in abudance. good tip btw. rgds. the philippines should really participate. we deserve to be recognized. And so much paper to be sent for recycling. I'm torn between Argentina & Egypt but that won't happen until early next year. The Philippine Postal Service has a website but I hope they can upgrade their online services similar to USPS. Oo nga, sinadya ko talagang magbakasyon sa Pilipinas gamit ang aking unang American passport. Bitin talaga. Maraming dapat pang puntahan but I ran out of time. Alam mo naman dito, napakakuripot magbigay ng bakasyon. It was a blast kahit ilang linggo lang. Too bad, di na tayo nagkita. Next time na lang. Wow, kala ko nadito ka pa sa Pinas. Bilis naman ng bakasyon. Dami nga ng mga letters mo for a week na nawala ka. Thanks for sharing the security strategy. may mga magnanakaw rin pala dyan sa NY kala ko sa Pinas lang. joke lang. 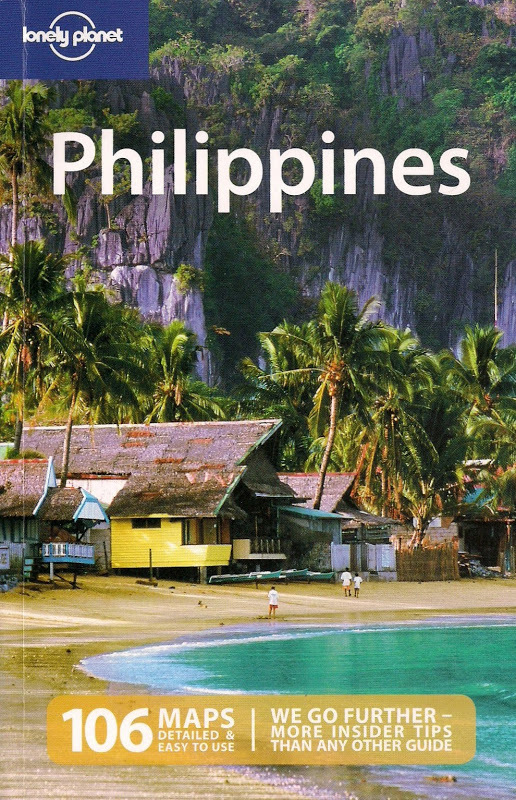 I am happy to know that Philippines is one of the participants on the coming exhibit in NY. Welcome back to 'tate! Did the storms cut your vacation short? the country spearheaded by DOT should always participate in travel expos like this if we really want to promote the country as a prime tourist destination. :) cheers kuya. napadaan ulit. Mabilis talaga ang bakasyon ko but it was worth it. Masaya na rin ako at napuntahan ko yung gusto kung puntahan sa Pilipinas. Not at all. It was just coincidental that my vacation was at its end. Salamat sa pagbisita. I'll be checking the DOT's participation this weekend in NY. Oh, you're moving down under? For sure, that means more traveling exposure and adventure. Will be checking your blog again. That's what the Philippines need, an aggressive marketing campaign. You'll find something similar where you are in a hardware store. Yes, I believe Sec. Duran is doing what he's supposed to do.